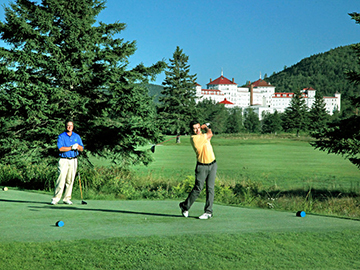 The Granite State is an outstanding golf vacation destination. From beautiful seaside resorts to magnificent mountain settings, New Hampshire golf courses will delight players of all skill levels. Some of the game’s most famous golf architects have created courses here, including Donald Ross and Robert Trent Jones, Sr.
New Hampshire has more than 90 golf courses around the state, from semi-private and public courses to the courses that are the centerpieces of some of the state’s finest resorts. Golfers can choose from seaside or lakeside courses, historic courses edged by mountains, or newer courses that follow the rugged natural contours of the land.